The Linksys Smart Gigabit Switch (LGS308, LGS308P, LGS308MP, LGS318, LGS318P, LGS326, LGS326P, and LGS326MP) offers a quick and easy solution to extend your office network. It allows you to run the system at low cost and does not require an advanced managed network. And, its web-based setup page provides you with simple configuration and management. This article will guide you on how to configure Quality of Service (QoS) on the Linksys Smart Gigabit Switch. 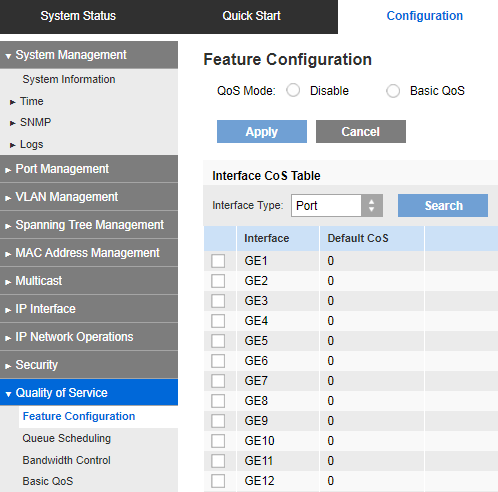 The Feature Configuration page contains fields for setting the QoS mode for the system (Basic or Disabled, as described in the QoS Mode section). You can also define the default Class of Service (CoS) priority for each interface in this section. NOTE: Some of the subtabs may vary depending on the model number of your switch. Click Configuration > Quality of Service > Feature Configuration. Disable - QoS is disabled on the device. Basic QoS - QoS is enabled on the device in Basic mode. 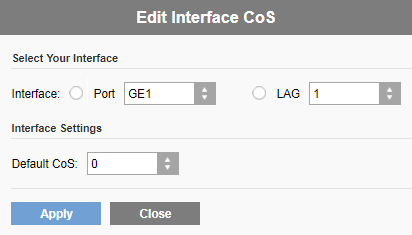 Select the Interface Type (Port or LAG) and click Search to display or modify all Ports or LAGs on the device and their CoS information. Interface - Type of interface. Default CoS - Default VPT value for incoming packets that do not have a VLAN Tag. The Default CoS is 0. The default is only relevant for untagged frames and only if the system is in Basic mode and Trust CoS is selected in the Basic QoS page. Click Apply. The Running Configuration file is updated. Select an Interface and click Edit. Interface - Select the Port or LAG. Default CoS - Select the default CoS value to be assigned for incoming packets (that do not have a VLAN tag). Click Apply. The interface default CoS value is saved to the Running Configuration file. The device supports four queues for each interface. Queue 4 is the highest priority queue. Queue 1 is the lowest priority queue. Strict Priority - Egress traffic from the highest-priority queue is transmitted first. Traffic from the lower queues is processed only after the highest queue has been transmitted, thus providing the highest level of priority of traffic to the highest numbered queue. Weighted Round Robin (WRR) - In WRR mode, the number of packets sent from the queue is proportional to the weight of the queue (the higher the weight, the more frames are sent). For example, if there are a maximum of four queues possible and all four queues are WRR and the default weights are used, Queue 1 receives 1 / 15 of the bandwidth (assuming all queues are saturated and there is congestion), Queue 2 receives 2 / 15, Queue 3 receives 4 / 15 and Queue 4 receives 8 / 15 of the bandwidth. The type of WRR algorithm used in the device is not the standard Deficit WRR (DWRR), but rather Shaped Deficit WRR (SDWRR). The queuing modes can be selected in the Queue Scheduling page. When the queuing mode is by strict priority, the priority sets the order in which queues are serviced, starting with Queue 4 (the highest priority queue) and going to the next lower queue when each queue is completed. When the queuing mode is Weighted Round Robin, queues are serviced until their quota has been used up and then another queue is serviced. It is also possible to assign some of the lower queues to WRR, while keeping some of the higher queues in strict priority. In this case, traffic for the strict priority queues is always sent before traffic from the WRR queues. Only after the strict priority queues have been emptied is traffic from the WRR queues forwarded. (The relative portion from each WRR queue depends on its weight). Click Configuration > Quality of Service > Queue Scheduling. Queue - Displays the queue number. Strict Priority - Traffic scheduling for the selected queue and all higher queues is based strictly on the queue priority. WRR - Traffic scheduling for the selected queue is based on WRR. The period time is divided between the WRR queues that are not empty, meaning they have descriptors to egress. This happens only if strict priority queues are empty. WRR Weight - If WRR is selected, enter the WRR weight assigned to the queue. % of WRR Bandwidth - Displays the amount of bandwidth assigned to the queue. These values represent the percent of the WRR weight. Click Apply. The queues are now configured, and the Running Configuration file is updated. The CoS/802.1p to Queue page maps 802.1p priorities to egress queues. The CoS/ 802.1p to Queue Table determines the egress queues of the incoming packets based on the 802.1p priority in their VLAN Tags. For incoming untagged packets, the 802.1p priority is the default CoS/802.1p priority assigned to the ingress ports. By changing the CoS/802.1p to Queue mapping (CoS /802.1p to Queue page), the Queue schedule method (Queue Scheduling page), and bandwidth allocation (Bandwidth page) it is possible to achieve the desired quality of service in a network. The device is in QoS Basic mode and CoS/802.1p trusted mode. 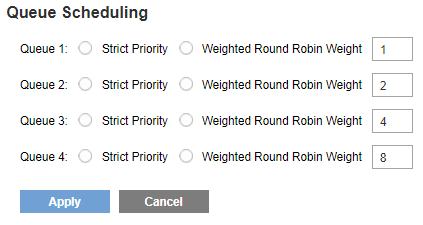 Queue 1 has the lowest priority; queue 4 has the highest priority. 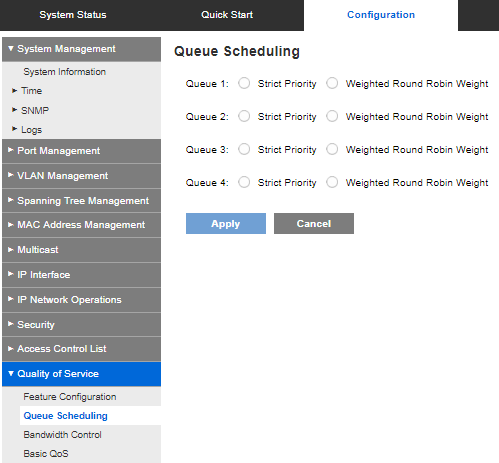 Click Configuration> Quality of Service > Basic QoS> CoS/802.1p to Queue. 802.1p - Displays the 802.1p priority tag values to be assigned to an egress queue, where 0 is the lowest and 7 is the highest priority. 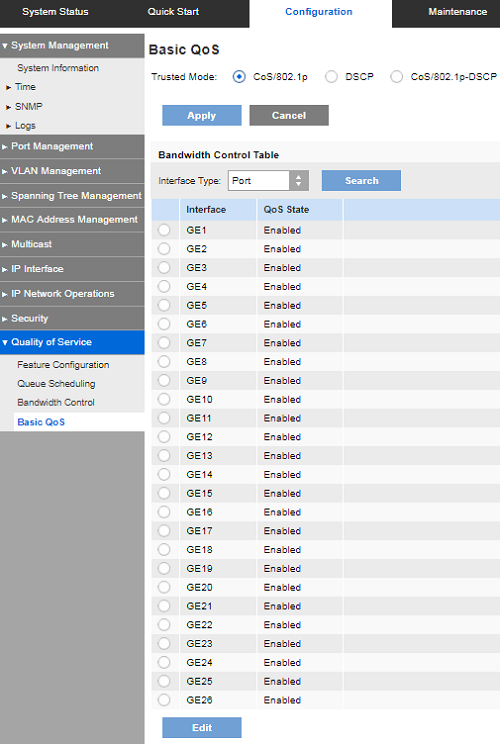 Output Queue - Select the egress queue to which the 802.1p priority is mapped. Either four or eight egress queues are supported, where Queue 4 is the highest priority egress queue and Queue 1 is the lowest priority. 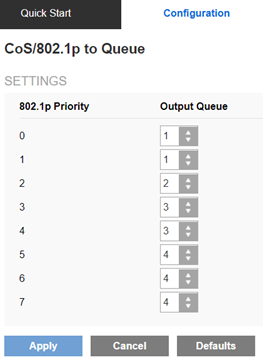 For each 802.1p priority, select the Output Queue to which it is mapped. Click Apply. The 801.1p priority values to queues are now mapped, and the Running Configuration file is updated. The IP Differentiated Services Code Point (DSCP) to Queue page maps DSCP values to egress queues. The DSCP to Queue Table determines the egress queues of the incoming IP packets based on their DSCP values. The original VLAN Priority Tag (VPT) of the packet is unchanged. By simply changing the DSCP to Queue mapping and the Queue schedule method and bandwidth allocation, it is possible to achieve the desired quality of service in a network. The DSCP to Queue mapping is applicable to IP packets if the device is in QoS Basic mode and DSCP is the trusted mode. Non-IP packets are always classified to the best-effort queue. The Queue 4 is the highest queue and the default classes in the parentheses are defined by IETF. Click Configuration > Quality of Service > DSCP to Queue. Select the Output Queue (traffic forwarding queue) to which the DSCP value is mapped. Click Apply. The Running Configuration file is now updated. The Bandwidth Control page enables you to define two values, Ingress Rate Limit and Egress Shaping Rate, which determine how much traffic the system can receive and send. The Ingress Rate Limit is the number of bits per second that can be received from the ingress interface. Excess bandwidth above this limit is discarded. Committed Information Rate (CIR) sets the average maximum amount of data allowed to be sent on the egress interface, measured in bits per second. Committed Burst Size (CBS) is the burst of data that is allowed to be sent, even though it is above the CIR. This is defined in number of bytes of data. 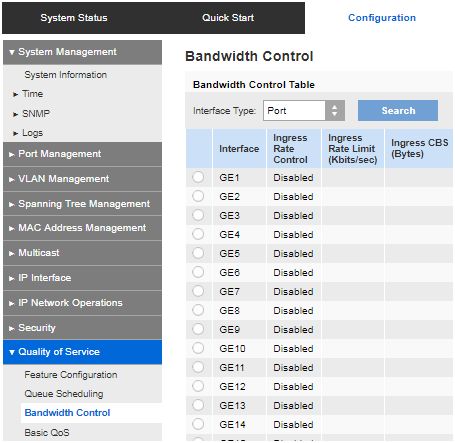 Click Configuration > Quality of Service > Bandwidth Control. 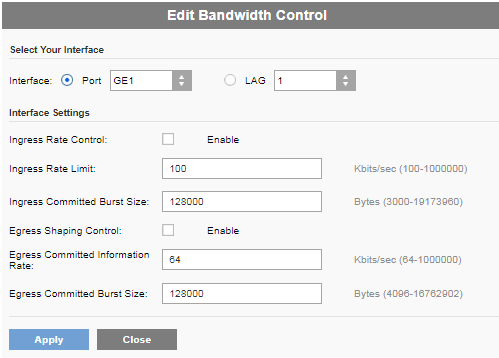 The Bandwidth page displays bandwidth information for each interface. Select an Interface, and click Edit. Select the Port or LAG interface. Ingress Rate Control - Select to enable the ingress rate limit, which is defined in the field below. Ingress Rate Limit - Enter the maximum amount of bandwidth allowed on the interface. Ingress Committed Burst Size - Enter the maximum burst size of data for the ingress interface in bytes of data. This amount can be sent even if it temporarily increases the bandwidth beyond the allowed limit. This field is only available if the interface is a port. NOTE: The above Ingress Rate Limit fields do not appear when the interface type is LAG. Egress Shaping Control - Select to enable Egress Shaping on the interface. Egress Committed Information Rate - Enter the maximum bandwidth for the egress interface. Egress Committed Burst Size (CBS) - Enter the maximum burst size of data for the egress interface in bytes of data. This amount can be sent even if it temporarily increases the bandwidth beyond the allowed limit. Click Apply. The bandwidth settings are now written to the Running Configuration file. In addition to limiting transmission rate per port, which is done in the Bandwidth page, the device can limit the transmission rate of selected egressing frames on a per queue basis. Egress rate limiting is performed by shaping the output load. The device limits all frames except for management frames. Any frames that are not limited are ignored in the rate calculations, meaning that their size is not included in the limit total. Per-queue Egress rate shaping can be disabled. Click Configuration > Quality of Service > Egress Shaping. The Egress Shaping page displays the rate limit and burst size for each queue. Select an interface type (Port or LAG), and click Search. Select a Port / LAG, and click Edit. This page enables shaping the egress for up to four queues on each interface. Queue x - Select to enable Egress Shaping on queue number x. Committed Information Rate - Enter the maximum rate (CIR) in kilobits per second (Kbps). CIR is the average maximum amount of data that can be sent. Committed Burst Size - Enter the maximum burst size (CBS) in bytes. CBS is the maximum burst of data allowed to be sent even if a burst exceeds CIR. Click Apply. The bandwidth settings are written to the Running Configuration file. In Basic QoS mode, a specific domain in the network can be defined as trusted. Within that domain, packets are marked with 802.1p priority and / or DSCP to signal the type of service they require. Nodes within the domain use these fields to assign the packet to a specific output queue. The initial packet classification and marking of these fields is done in the ingress of the trusted domain. Click Configuration > Quality of Service > Basic QoS. Select the trust-behavior using the Basic QoS page. The device supports CoS/802.1p trusted mode and DSCP trusted mode. The CoS/802.1p trusted mode uses the 802.1p priority in the VLAN tag. DSCP trusted mode use the DSCP value in the IP header. In Basic QoS Mode, it is recommended that you disable the trusted mode at the ports where the CoS/802.1p and/or DSCP values of the incoming packets are not trustworthy. Otherwise, it might negatively affect the performance of your network. Incoming packets from ports that are disabled without trust mode are forwarded in best effort. The Basic QoS page contains information for enabling Trust on the device. This configuration is only active when the QoS mode is in Basic mode. Packets entering a QoS domain are classified at the edge of the QoS domain. Follow these steps to define the Trust configuration. CoS/802.1p - Traffic is mapped to queues based on the VPT field in the VLAN tag, or based on the per-port default CoS/802.1p value (if there is no VLAN tag on the incoming packet), the actual mapping of the VPT to queue can be configured in the mapping CoS / 802.1p to Queue page. DSCP - All IP traffic is mapped to queues based on the DSCP field in the IP header. The actual mapping of the DSCP to queue can be configured in the DSCP to Queue page. If traffic is not IP traffic, it is mapped to the best effort queue. CoS / 802.1p-DSCP - All IP traffic is mapped to queues based on the values in their DSCP field. All non IP traffic is mapped to queues based on their CoS/802.1p value. 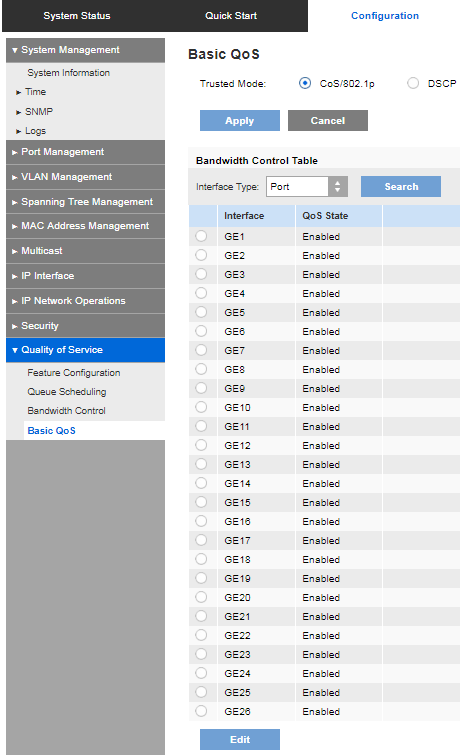 To disable QoS on a port, click Edit, select a Port or LAG, uncheck the QoS State box. Click Apply. The Running Configuration file is now updated with the new settings. The Queues Statistics page displays queue statistics, including statistics of forwarded and dropped packets, based on interface, queue, and drop precedence. Click Configuration > Quality of Service > QoS Statistics > Queues Statistics. Refresh Rate - Select the time period that passes before the interface ethernet statistics are refreshed. No Refresh - Statistics are not refreshed. 15 Sec - Statistics are refreshed every 15 seconds. 30 Sec - Statistics are refreshed every 30 seconds. 60 Sec - Statistics are refreshed every 60 seconds. Set 1 - Displays the statistics for Set 1 that contains all interfaces and queues with a high DP (Drop Precedence). Set 2 - Displays the statistics for Set 2 that contains all interfaces and queues with a low DP. Interface - Queue statistics are displayed for this interface. Queue - Packets were forwarded or tail dropped from this queue. Drop Precedence - Lowest drop precedence has the lowest probability of being dropped. Total Packets - Number of packets forwarded or tail dropped. Tail Drop Packets - Percentage of packets that were tail dropped. Counter Set - Select the counter set. Interface - Select the ports for which statistics are displayed. Port - Selects the port on the selected unit number for which statistics are displayed. All Ports - Specifies that statistics are displayed for all ports. Queue - Select the queue for which statistics are displayed. Drop Precedence - Enter drop precedence that indicates the probability of being dropped. Click Apply. The Queue Statistics counter is now added and the Running Configuration file is updated. You should now have successfully configured the QoS of your Linksys Smart Gigabit Switch.